Prime Minister Narendra Modi travels from Pentrich Railway Station to Pietermaritzburg, South Africa on Saturday. The train resembles the one on which Mahatma Gandhi ji travelled. 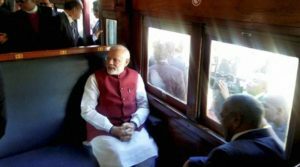 Pietermaritzburg (SA): Reliving history, Prime Minister Narendra Modi today retraced Mahatma Gandhi’s train journey in South Africa as he travelled to a railway station where Gandhi was thrown out of a train compartment that proved to be a turning point in his life. On the second day of his visit to South Africa, Modi boarded a train at Pentrich and travelled to Pietermaritzburg, a distance of around 15 km, paying tribute to Gandhi’s fight against racial discrimination. On 7 June 1893, while Gandhi was on his way to Pretoria from Durban, a white man objected to his presence in a first-class carriage, and he was ordered to move to the third- class compartment. Gandhi had a valid first-class ticket and refused to obey the orders following which he was thrown out of the train at Pietermaritzburg station in a winter night. He had stayed at the station that night in shivering cold and the bitter incident had played a major role in Gandhi’s decision to stay on in South Africa and fight the racial discrimination against Indians there. The Prime Minister visited the spot where Gandhi was offloaded from the train. Modi will also visit the Phoenix Settlement, which is very closely associated with Gandhi. “PM travels from Pentrich Railway Station to Pietermaritzburg. Train resembles the one on which Gandhi ji travelled,” the PMO tweeted. After talks with South African President Jacob Zuma, the Prime Minister yesterday had paid glowing tribute to Gandhi as well as Nelson Mandela. “For me personally, this visit is an opportunity to pay homage to two of the greatest human souls to have ever walked this Earth – Mahatma Gandhi and Nelson Mandela,” Modi had said. He further said, “We stood together in our common fight against racial subjugation and colonialism. It was in South Africa that Gandhi found his true calling. He belongs as much to India as to South Africa.